Welcome to the SoCShop! Our brand new space for electronics prototyping is open for business in the School of Computing Science. In the Lilybank Gardens Room F102, you’ll find a variety if resources ready to support research in the School of Computing Science. The SoCShop has a good assortment of components available for electronics projects, such as LEDs, jumpers, sockets, pins, and clips. We have a full range of resisters and capacitors, as well as a reasonable selection of diodes. We also have a variety of commonly used integrated circuits (ICs). A small selection of breadboards are also available. Need to solder something? The SoCShop has everything you need to get started. Two ERSA RDS80 soldering stations are available to use, along with all the necessary accessories, including solder, flux, desolder braid and pumps and helping hands. 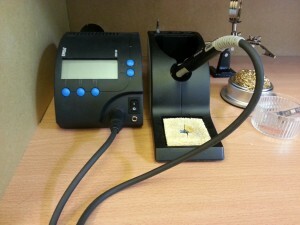 Workshops and training are available if you are interested in learning how to solder. Visit the workshop for more details. The SoCShop has two workspaces where you can spread out and get things working. 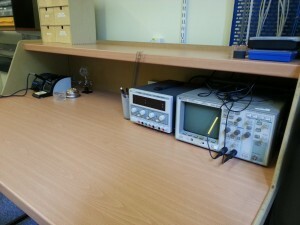 The first workspace is a large standing desk fitted with an ERSA soldering station, desktop power supply, oscilloscope, and portable multimeter. 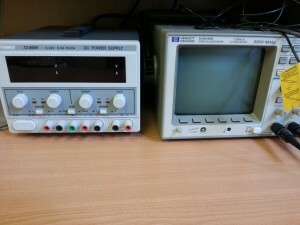 Mains power is also available at this workstation. 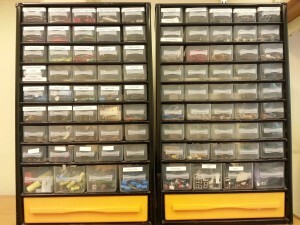 Tools and supplies, such as side cutters, pliers, veroboards, wires, and soldering supplies are all available at this workspace. Our desktop power supply offers two flexible power outputs with an additional 5V outlet. The second workspace offers a flexible space to work. 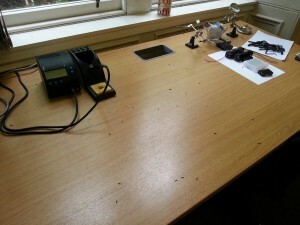 This desk is fitted with an ERSA soldering station. The SoCShop also has a variety of random tools and helpful stuff available, such as heat shrink materials and heat gun, a hot glue gun, and network toolkit. So come by and have a look at all the resources that are available. Send any questions or comments along to Julie at Julie.Williamson@glasgow.ac.uk. Join the SoCShop Mailing List to keep up to date about the workshop.